What do you do when you can't sleep and wake up at 5:00 AM for no particular reason? In my case, it was time to work off a weekend of only eating 2 meals per day made up of fast food burgers or pizza. So where my daily calories might have been lower than usual, it was still time to kick some endorphins and get ready for the holiday week. Didn't feel like hitting the gym so I opted for a push up centric workout at home. 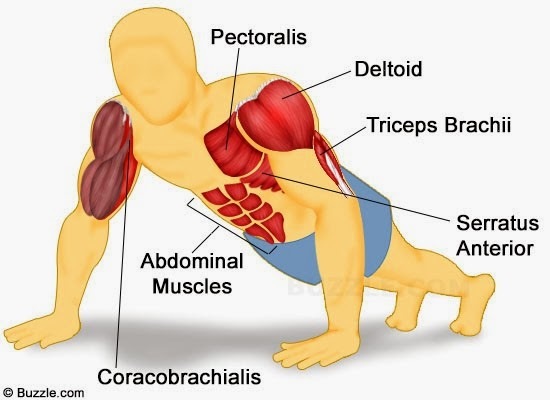 Like Chins, Push Ups are a great exercise you can do a million ways, anywhere and at any given time. You only need enough space to get into position. To spice up my session, I did sets to hit all three parts of the pecs: upper, middle and lower. You need to work the upper portion to tie into your shoulders, neck and clavicle while middle gives you that mass and width so you avoid narrow bird chest syndrome then lower tightens up the edges and bottom for that good slab like appearance. I also recommend elevating each hand individually so you get a little more stretch out of the exercise. In my apartment's spare room/office/gym I just use a couple hard cover novels about 2 inches thick. Hand position wise I opted for normal, just outside shoulder width and wide. Remember to keep your elbows close to the body so you're not putting all the stress on your shoulders. For Incline, just put your feet up on your bed, a stool or a Swiss Ball if you've got one. Doing them off a Ball will make it a little tougher as you've got to maintain stability so your core gets more work. For regular, feet on the ground is fine while decline you can place your hands on a stair, a small box or even a coffee table, whatever you have around. Phase I - Push Ups & Barbell Curls: For mass, size and shape I alternated these two exercises doing 2 sets each of incline, regular and decline push ups. For Curls, I bent at the waist, keeping my back straight and gripped the barbell at shoulder width. It's kind of like a Spider or Preacher curl without a bench. To really pump up my bi's, I would complete 8-10 full reps then do 3-4 partial "half" reps. When the weight started to get heavy and I couldn't complete many reps, I'd strip the bar every few repetitions until I got 8-10. Since I was working out at home, I chose simple exercises that could be done back to back, superset style with little rest or weight/equipment changes in-between. Doing Fly's on a Swiss Ball you can roll your body into incline or regular position. As the weight got heavier I switched to Pullovers and Concentration Curls to avoid strain on my shoulders or elbows. Pullovers can be done on the Swiss Ball or on the floor with a rolled up towel or throw pillow under your upper back. That was it for weights then I moved downstairs for cardio consisting of 1 mile on the bike as fast as I could followed by jump roping for 2 minutes then abs. I repeated this 3 times and called it a morning. It wasn't even 7:00 AM yet but my Monday was already moving right along. Van Dammage - Gotta Eat!